I. A. WATSON CONTINUES DOWN THE ROAD TO BYZANTIUM IN LATEST PRO SE SINGLE SHOT SIGNATURE RELEASE- STONE AND FIRE! Award Winning Author I. A. Watson, one of the most prolific voices in New Pulp, returns readers to a world of history of fantasy, one marred with magic, monsters, and mystery in the second chapter his exclusive original Pro Se Single Shot Signatures Series-Byzantium. In a world where Christianity never arose to sweep away the old magics, where sorcerer-guilds and necromancer-kings rule amidst the Roman ruins, Kirkgrim the Wanderer joins a caravan train across war-torn wasteland to the world's most corrupt city. The reluctant hero finds himself trapped with travelers, refugee orphans, deserter soldiers, a beautiful hunted sorceress, and one mad viking, amidst civil war, religious zealots, brutal reavers, and a growing zombie army - guarding a secret that could bring the last vestiges of civilization crashing down in flames. In Byzantium Book Two: Stone and Fire, the caravan encounters death and destruction at the hands of bandits and the undead, desperate and possibly traitorous Imperial soldiers, a decimated bridge, and a battle between two elemental giants that very well could spell the end of the caravan, even with the holy Kirkgrim the Wanderer as its protector. 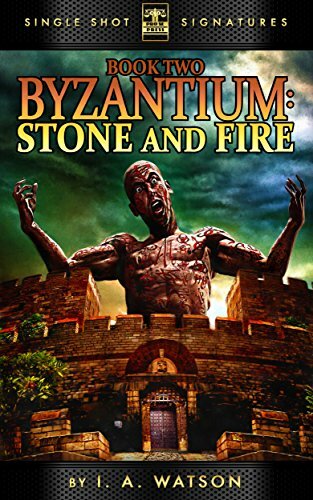 Byzantium Book Two: Stone and Fire features epic cover art and logo design by Jeff Hayes and eBook formatting by Russ Anderson. The second digital single in I. A. Watson’s series is available for the Kindle for only 99 cents at http://tinyurl.com/ns9ddwg and for most digital formats via Smashwords at http://tinyurl.com/nj4f2zl. RICHARD KNIGHT RETURNS TO PULP OBSCURA IN ‘RACE WITH HELL’!